A new product has hit the streets in the form of Smart recycle bins, these are bomb proof and have WiFi connection, this is what we call the “phone rubbish connection’. It is a great idea but would you want to stand near a garbage can just to stay connected? 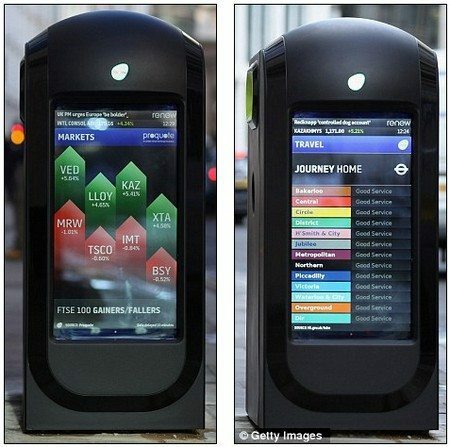 According to Dvice by way of the Daily Mail, the City of London will soon be littered with smart recycle bins that have the ability to display the latest news on global finance, and the so called Renew bins, which have apparently been in the pipeline for some time have screens on both sides. Apparently there are 25 of these recycle bins already on the streets of London with another 75 being installed before the London Olympics and content is currently supplied by the London stock exchange and The Economist. Word is though these recycle bins have difficulty getting the Internet at stations such as Waterloo due to the huge volume of smartphones being used during rush hour. The bins cost about Â£30,000 to build and install and are big enough to hold a wheelie bin inside to make it easy for bin men to collect and empty, and apparently these bins will soon be making their way to New York, Tokyo and Singapore’s financial districts. Now word on just what these recycle bin actually accept for recycling, but one can assume it’s the usual stuff. Other than that financial content these bins do apparently also offer weather updates, general news headlines, travel, sport, entertainment, fashion and arts news. Now if they could slap a mobile phone wireless charger into these bins then they would probably be more useful to the everyday London visitor. Great idea, but it looks like it’s hard to use.